Update: We've updated this review with the latest price and software information for the Moto G5, along with comparisons to the newer Moto G6. Motorola's G series is the firm's best selling phone range ever, and the main 2017 instalment in the budget line is the Moto G5. Manufacturer Lenovo (the owners of the Moto brand) has decided to kick things up a notch with a more premium, metallic design and an impressive host of extras that you wouldn’t usually expect to find in a phone this cheap. Just like the previous year’s Moto G4, the Moto G5 starts at sub-£200, but the plastic has given way to aluminium and there’s a snazzy fingerprint sensor now too (although the larger, and pricier G4 Plus was the first G series handset to have this tech). The Moto G5 is also upgradeable to Android 8.1, so its software is almost up to date, and it includes some handy gestures and options via the Moto app. But the chipset has oddly had a downgrade and the screen is smaller than the G4's, so is the G5 really a worthy successor? And is it still worth considering now the Moto G6 is out? The basic version of the Moto G5 with 2GB of RAM launched at £170, but we've now seen the price drop down to around £120 from a variety of different retailers, while you're looking at roughly AU$299 in Australia. With the Moto G6 arriving soon, the price may soon drop even further. The G5 usually comes in gold or grey, but O2 stocks an exclusive blue version. 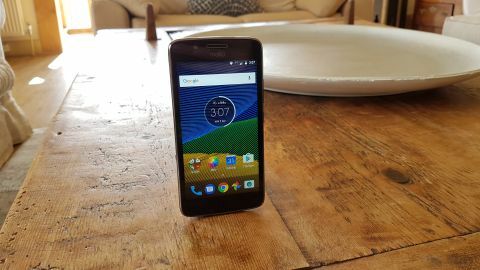 You can pay around an extra £10 to get 3GB of RAM and dual SIM support if you buy online via Motorola or Amazon and we recommend that you do. That £170 would have been around $200 in the US, but the bad news is that the Moto G5 is not available Stateside. Bargain hunters in the US will have to make do with the Moto G5 Plus or a newer model like the Moto G6. Some markets will only get the version with 2GB of RAM, but our review unit has 3GB under its grey exterior, along with space for a second SIM card. Lenovo’s tagline is “Premium for all” and that idea is immediately apparent in the design of the Moto G5. While the Moto G series has always been lauded for packing great specs into affordable handsets, it has never been known for style. That changes with the Moto G5. This is a good-looking phone with a satisfying heft, thanks to the aluminium rear panel. It has a seriously slick, indented fingerprint sensor below the screen on the all-glass front, with a subtle sliver of metal around the speaker at the top. A silver circle surrounds the large camera module on the back with a classy M logo etched into the metal panel. This is easily the most attractive Moto G we’ve ever seen. It also boasts a 13MP main camera with phase detection autofocus and a 5MP selfie camera with a wide-angle lens for group shots. That’s an impressive set of specs on paper. Throw in rapid charging and the usual suspects in terms of connectivity and it’s clear the Moto G5 brings a lot to the table. At first glance, the only obvious omission here is NFC. While the design of the Moto G5 is impressive, it’s not going to catch your eye in the way that something like the Samsung Galaxy S9 will. We can say it looks good, but we always have to add the qualifier “for the price”. If we compare it to the previous year’s Moto G4, which was all plastic and lacked a fingerprint scanner, the forward strides are obvious. The metallic back looks and feels nice, and the metal panel gives way to a plastic bumper section at the top and bottom, which will be more durable in the event of a fall. It's not, however, as premium as the Nokia 5 and Nokia 6, which boast full metal bodies crafted from a single piece of aluminium. For that matter the newer Moto G6 also has a more premium design. On the bottom edge, you’ll find the micro USB port and a small indent to help you prise the back off to reveal the removable battery, SIM slots, and the microSD card slot (up to 128GB). There’s a standard 3.5mm headphone port up top and the right spine has a smooth volume rocker with a textured power button below it. On the glass front, there’s the front-facing camera and speaker at the top, with a Moto logo, and at the bottom there’s the concave fingerprint sensor and microphone. The display is a 5-inch IPS LCD with a resolution of 1920 x 1080 pixels. It’s sharp, in fact, at 441 pixels per inch, it’s a touch sharper than the display on the Moto G5 Plus. It’s also bright and vibrant and will serve you well for reading, watching videos, or gaming. The big bezels around the screen are one of the few clues that this is a budget phone, but you can’t have everything.